Alejandra Juarez's daughter and Rep. Darren Soto plead the case of military spouse Alejandra Juarez, who is set for deportation in June. 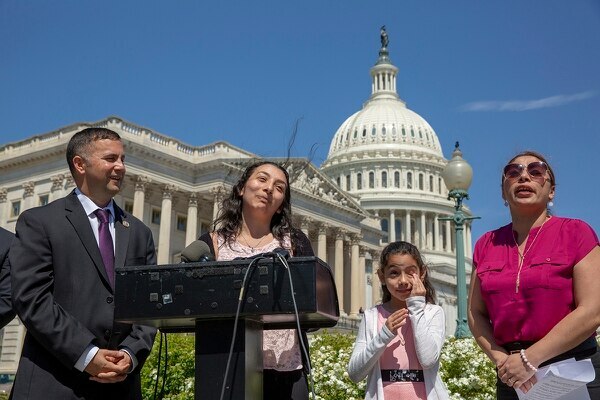 Members of Congress stood beside military spouse Alejandra Juarez on Capitol Hill Thursday as they introduced a new bill to help prevent her deportation and the deportation of potentially thousands of other military family members like her. Rep. Darren Soto, D-Fla., introduced H.R. 5593, “Protect Patriot Spouses Act,” which would amend the Immigration and Nationality Act. Under the current law, military spouses who entered the country illegally may not pursue citizenship without first departing the country. Alejandra, her husband, former Marine and Florida National Guardsman Cuauhtemoc “Temo” Juarez, and their children Estela, 8, and Pamela,16, live in Soto’s district. Soto’s office is still waiting to hear from the Department of Homeland Security on his office’s request to review Alejandra’s case. If DHS refuses to intervene, Alejandra Juarez will have to report to immigration agents in June for deportation. Alejandra and both of her daughters spoke in front of the cameras, directly imploring President Donald Trump to reconsider their case. “My dad did sacrifice a lot for this country, so we were already separated for that time when he was gone,” said daughter Pamela Juarez, asking that they not be separated again. Under Soto’s amended act, spouses married to active duty or veteran service members with an honorable service record would be eligible to waive that previous inadmissability and allow the spouse to stay in the U.S. while they pursue legal residency. Alejandra Juarez would need additional reprieve beyond the legislation, for a false claim of U.S. citizenship as she tried to cross into the U.S. the first time as an 18-year-old. As Juan Quiroz readies to get underway aboard the amphibious assault ship Essex, his wife faces a deportation order and could be kicked out of the country while he's gone, leaving behind their two boys. The amendment is not unlike the Parole-in-Place program touted by Vice President Mike Pence when he was an Indiana representative in 2010, a fact not lost on Rep. Anthony Brown, D-Md. “When I was in Iraq, I served side by side with patriotic Americans. Some of us were citizens. Others were not,” said Brown, an Army Reserve colonel with 30 years active duty and Reserve service. Texas Rep. Joaquin Castro, D-San Antonio, and Rep. Norma Torres, D-California, also spoke, reading the names of additional veterans or service members from their districts who have either already been deported or face deportation. Since President Donald Trump took office, he has directed DHS to strictly enforce immigration laws and increase the number of deportations it conducts. There are as many as 11,800 military families with members potentially facing deportation, American Families United has reported. There are various bills under consideration in Congress to assist veterans or their dependents who are facing deportation, and legislation to bring some previously deported veterans home. The bills have been part of the larger immigration debate, which has been stalemated over disagreements on border wall funding and protections for Deferred Action for Childhood Arrivals, or DACA recipients, young men and women who were brought to the U.S. as children and have tenuous protections from deportation.